Does Spinraza Work - YES! On Wednesday, March 6th Emmett will be at BC Children's Hospital for another treatment of the drug Spinraza. This is going to be his fourteenth lumbar puncture where they withdraw spinal column fluid and replace it with fluid containing the drug. This is also a day which is full of Emmett meeting all of his friends from his medical team - plus likely a few new faces. Before we get into all of that, we want you to know that Emmett is already looking forward to going camping this summer. He knows the campground he wants to go to. He knows that he wants his parents and all of his grandparents to join him (of course, Emmett is not old enough to go camping by himself!). And he's planning on going to the race car track with his grandpa. He recently was talking about this and then talked about how last summer his caregiver (I don't want to identify Alisha so I'll just say his caregiver to be anonymous) forgot to pack his hearing protectors. So we didn't spoil his day or his earing, he used some of my soft ear protectors that fit into the ear canal. They were orange - he remembered that too. He literally remembered all of this and was talking about it without any prompting from the adults around. Alisha, laughing, asked him how he remembered this from so long ago. His response was a typical Emmettism - "It's just been stuck in my head for a long time!". What a memory this kid has. A memory that could be helped by the fact that he has a huge brain! Literally - his head is gigantic. We bought him a bike helmet for 5 year olds. Not big enough so back it went. Bike helmets for 8 year olds. Too small. We have to get him a youth sized helmet. What is really ironic about this, is that this kid with the large head is afflicted with a disease that affects all of his muscles. It is incredibly hard work for him to hold his head up (his neck muscles are getting stronger and stronger) and how much easier would it have been with a normal or smallish sized head! Sigh. Well, his neurologist told Alisha and Josh early in his life to ensure that they made memories and so they have. And Emmett with his large brain has the amazing capacity to remember an incredible amount of these family memories. Every day is fantastic. Every day is a challenge. But still fantastic. Emmett does not like the lumbar puncture - and he is old enough to recognize the tests/visit which means it is a lumbar puncture day. He's a smart kid. He does not like the blood tests. He really does not like the nerve conduction study - fortunately that now only happens once a year. Unfortunately that 'once a year test' is this visit. Emmett really enjoys most of the rest of the sessions that happen during the day. They put him through a physio therapy workout which, if he's in a good mood (he will be if it happens before the nerve conduction study and the blood work), he loves showing off his moves. Of course, he doesn't always do what is expected. Par for the course at his age. If he's had the blood work already, he'll tell the therapist about it and show the bandages. Indicating and saying that this is why he won't move that arm! He loves talking with the therapists, the nurses, the staff, and the doctors. They are his medical team. So as you go through your day, say a prayer for Emmett. 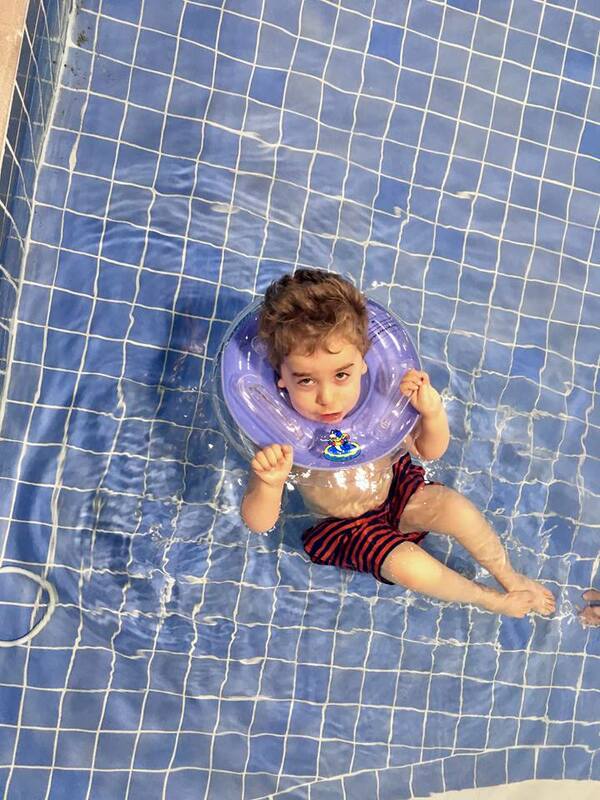 Think about him, his mom and dad, as they spend the day at the hospital. Think about others that you know who spend so much time at the hospital that everyone knows them and they know everyone. That is probably not how they planned to spend that time. 14 lumbar punctures with this drug called Spinraza. Emmett has been receiving this drug as long as, if not longer, than anyone else in Canada. He is still part of the study being held to study the effects of this drug, which is now owned by the company Biogen. When Emmett began this study no one really knew if the drug worked. It literally was an experiment. It did and it does work. 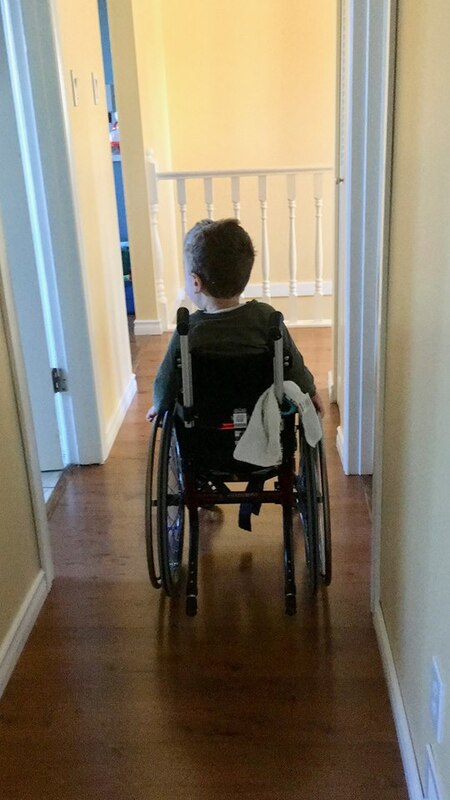 Not only did Spinraza STOP this disease known as Spinal Muscular Atrophy (of the commonly identified four types, Emmett has Type 1 which is the most severe) but it has ACTUALLY reversed the disease. Emmett has absolutely improved. What is even more amazing is that the improvement that Emmett has demonstrated simply did not happen with SMA prior to Spinraza. Children with SMA could be supported and cared for, obviously, but there was no means of changing the ongoing degeneration of this disease. That was the message received when Emmett was diagnosed in 2015 - there was no known medically approved treatment for SMA. But there was a trial. And now there is a treatment - Spinraza. Canada has approved this drug. So have many other countries. Other countries have approved it for many if not all individuals with Spinal Muscular Atrophy. But NOT Canada - except for the province of Quebec. After consideration, Quebec has approved it for all individuals with SMA. Quebec has a different process of recommending approved drugs for individuals than the rest of Canada. Emmett has undergone so much to help prove to Canada and the world that this drug works. It was a risk that Alisha and Josh took. Obviously, we're all glad that they did. Spinraza is literally a life changing and miraculous medication. Yet in Canada there are individuals who cannot access this approved by Health Canada drug. It has only been approved for a minority. The rationale given for limiting access to this drug, by the committee that makes this recommendation, is that there is not enough data to prove it works. Technically correct. I believe that it is also correct to say that drugs, like Spinraza, which are developed for rare diseases like SMA mean that typical benchmarks must be set aside and other factors considered. There is not enough data because the formal testing and the scientific blind study was stopped early. One of these was the study of which Emmett was a part. A study that we, individuals who knew nothing about the scientific trials and discoveries that were taking place, in which we knew Emmett was getting the drug rather than a placebo because he was improving. The drug company STOPPED the test and then provided the drug to all participants BECAUSE participants on the placebo were dying. The vast majority of those on the drug were improving. It was not humane to continue with the blind study when facts overwhelming proved the drug worked. This is not to say that everyone with SMA will be cured. Spinraza is not a cure. Emmett is not cured. Every day is a struggle for this little boy. But access to this drug Spinraza is an incredible opportunity for Emmett and for everyone with Spinal Muscular Atrophy. This drug is expensive. Understandable when you take into consideration that it reconfigures the nervous system to transmit messages to the muscles. That takes some work. Understandable when only a hundred people worldwide are getting the drug. But the price must come down when the numbers of users is increasing. The Canadian government got a discount - although we don't know what that figure is. Certainly it is expensive. This is a rare disease and an even rarer drug discovery. That changes lives! If you would like to support CureSMA Canada as they seek to get improved access to this drug, please consider writing your MP, MLS/MPP, your provincial Health Minister and Deputy Health Minister. We are not asking this for Emmett. Emmett meets the current requirements. We are asking on behalf of Emmett's friends and individuals that Emmett doesn't even know. We are asking on behalf of Emmett's friends who have already lost this battle. Emmett, Alisha, and Josh participated in this study with the hope of a better life not just for themselves, but for everyone stricken with this disease. The potential for that better life is right there in front of many of these families who know that this drug works - if only this drug was available to them. If you want to send a letter to encourage the government to reconsider, below is text that you can copy and update with the information for your province or territory. Emmett thanks you. So does all of his family. Please support reimbursement for all patients who require the drug Spinraza. 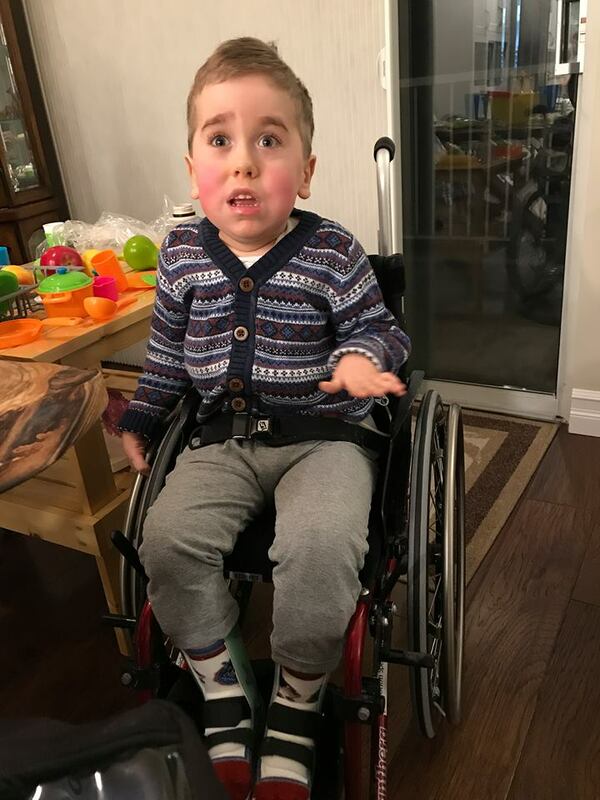 You are already aware of the pressures that are being applied to the Spinal Muscular Atrophy (SMA) patient community in Canada. These are people attending school, university, volunteering in their communities, hold careers and have families. However, with SMA, the body becomes weaker and weaker, patients lose lung function and motor function, but it never affects their cognitive abilities. These people laugh, learn, love, and cry. They know that they have a terrifying genetic disease. Until now this serious, life limiting neuromuscular disease has never had the benefit of a treatment. Biogen’s Spinraza (Nusinersen) has been developed and is the only treatment that has ever been proven effective and come to market for SMA. Spinraza was approved by Health Canada, however, the original recommendation from CADTH was only to approve treatment for a small subset of type 1 patients. After a resubmission and appeal by Biogen, CADTH has offered a broader coverage, however, still only encompassing type 1 patients and type 2 patients up to the age of 12. This narrow selection of patients recommended for reimbursement is a devastating blow to the entire SMA community and its supporters. The remaining patients affected by SMA will steadily decline as the disease progresses and they will eventually die from the disease. Everybody should have the right to be all that they can be, to achieve career and personal goals, to have hopes, a future, an improved quality of life, as well as longevity. How can we as a country allow a disease to cause even one person to lose their functionality and die when there is a proven safe and effective treatment to halt the progression! This disease has always been considered a tragic diagnoses, but in Canada it is even more devastating because there is a treatment that many are unable to access. 45 countries plus the province of Quebec have approved broad access. The same data was submitted to all of these countries and now, due to the delays within Canada, there is even more information available of the benefits of Spinraza for all ages and types. This overwhelming evidence should not be overlooked or dismissed, but it has been! We implore the provincial governments to approve reimbursement for all patients. Those with SMA and their families have been waiting and hoping for many years for this day that there is medical hope. We have a treatment now and it is an incredible injustice that access for all patients is not available. There are no other treatment options for SMA. Make the right decision, the clock is ticking for individuals with SMA - without treatment it gets louder every day. Help us change the outcome to one that saves lives!